Are you shipping hazardous materials cross-border? Most countries have different ways in which they handle the shipment of hazardous goods and materials. When shipping between Canada and the United States separate documentation will need to be filled out. Some materials will even require the approval of an emergency response assistance plan before they can be shipped. It is important to note the different systems of labelling, and placards, that are required when shipping cross-border between the United States and Canada. C&D Logistics has all of the answers to your cross-border shipping questions. Contact us for information on cross-border shipping between Canada and the United States. What shipping methods are you planning on using? There are different classes of hazardous materials including flammable, toxic, corrosive and more. Each of these classes has different regulations that must be followed with regards to shipping procedures. Not all of these classes are allowed to be shipped via air. Some are only permitted to ship via ground. Due to the complexity of these classes and the varying shipping regulations, it is important to consult with a team of shipping and logistics experts that are familiar with the proper protocol. Contact C&D Logistics for any questions you have regarding the rules and regulations of shipping dangerous goods. Have you filled out the proper documentation? When shipping hazardous materials it is absolutely imperative that you provide the proper documentation. The correct documentation depends on what types of materials you are shipping, and whether or not they are domestic, within Canada, or cross-border to the United States. For proper domestic shipping familiarize yourself with the Transportation of Dangerous Goods Act. This act outlines the necessary labelling and packaging requirements within Canada. 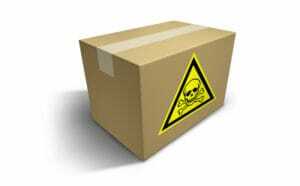 When shipping to the United States it is the Toxic Substances Control Act that will be used to regulate the shipment of potentially dangerous materials. For questions about shipping hazardous goods, please contact C&D Logistics at 604-881-4440. We would be happy to answer any questions you may have. Our team of shipping and logistics experts specialize in logistics services and specialized freight. We have a large selection of shipping equipment including flat deck trucks, step deck trucks, double drop trailers, temperature controlled trucks, and dry vans to ensure that we can meet all of your shipping needs. Fill out one of our online forms today for a free quote.